Here’s an addendum to what I wrote here about German electric power a couple of days ago. Apparently things are worse than we thought. The climate protection scam is truly a colossal cash-cow for the government and a narrow special interest. German power now costing consumers tens of billions of euros. 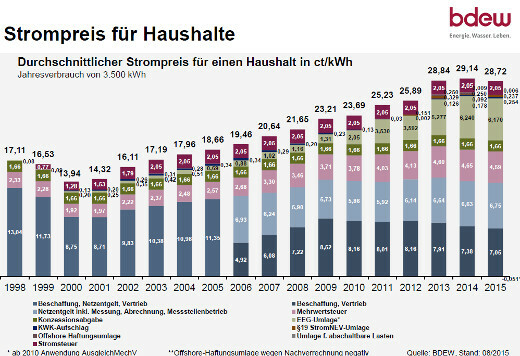 Chart above shows Germany’s average household price per kilowatt-hour. Image: BDEW. The taxes, tariffs and surcharges represent 55% of the German power bill, almost double what it was in 1998. manager-magazin reports the average kilowatt-hour of electric power has now reached 29.16 euro-cents, and blames the feed-in act as the main price-driver. German households are currently paying over 100 euros a month just for their electric bills – a “record level”. The manager magazin reports that the average household now pays 1223 euros a year for power, up 2% from a year earlier. The vast majority of analysts say the price spiral will continue, with no end in sight over the next few years. Not only electricity consumers are being hit, but so is Europe’s green power sector, which was once touted as a jobs creation machine for the future. German national daily Die Welt here reports that electrical engineering giant Siemens will close a wind energy production equipment facility in neighboring Denmark, thus costing 430 jobs. The closure comes at the heels of the company announcing the lay off 150 workers at its rotor blade facility in Aalborg. Siemens cites a streamlining of its operations and reports of record orders for wind turbine equipment this year. The company also announced plans to invest some 200 million dollars in Mexico over the coming decade, which according to Chairman Joe Kaeser will create 1000 jobs. It’ll be interesting to see if the equipment will be exported from Mexico and into the United States. I have a chainsaw and some other gear designed by Stihl but mostly manufactured in the USA. Put simply – it works. The American branch of Stihl Group is mostly in Virginia Beach, Virginia, since 1974. This was a result of a big increase in the landscaping market. Nothing to do with the current state of affairs in Germany. I just though it was time to say something nice about Germany. That was then. This is now. We are at war not only against the warmunist scam but against ALL the rot and the false religions that the corruptocracy of the past decades has spread all over the West. It is a parasitic overgrowth both sides of the Atlantic. USA has started to clean house. Germany will follow. Coal and nuclear also had a price bill, but nobody saw it. Transparency is a problem, when dealing with the fake news crowd. Why don’t you give us a chart comparing EROEI for your favorite sources of electrical power vs. your most loathed ones? Most EROEI numbers do not count ecological damage at all. Which is a really good thing for wind and solar, both of which are HIGHLY environmentally destructive. Coal and gas, on the other hand, produce much needed plant food CO2. Another load of nonsense from the fossil industry. Germans paid the price for bringing about the solar revolution, but that cost was nothing compared to the freedom the entire world is about to enjoy. Ask the German people if they like their 3-4% unemployment rate that ran right through the recession on the back of their renewables legislation. Perhaps that’s why 70+% of Germans support these one-time costs to purchase permanent energy freedom. The left socialist totalitarian control agenda will be swept aside, and personal freedoms will be re-installed. Once that agenda is squashed and the waste on unreliable power supplies brought to a halt, then solid, RELIABLE power supply systems can be re-built. You mean the one where 100s of billions have been spent over the past 20 y, so a few posers can claim that couple of percent of German electricity comes from the sun? What has does this “revolution” actually accomplish? It has made solar PV cheaper than all other forms of electricity in many places. It allows tropic islands to run on 100% solar already today and this will progress even further in the near future. Anything else that i should explain to you? Tiny, niche, short-term, subsidy exhausting fantasies. In a place that does absolutely nothing except preen itself. You would feel totally at home there, but still stay where you can get real consistent energy to make you decaff lattes. Chinese panels being off-loaded real cheap because no-one else them. Cost of Fukushima clean up: $180 Billion. So what do we do, with all the money we are saving?